I have started on a new job while I am waiting to get back to the big ceiling job. 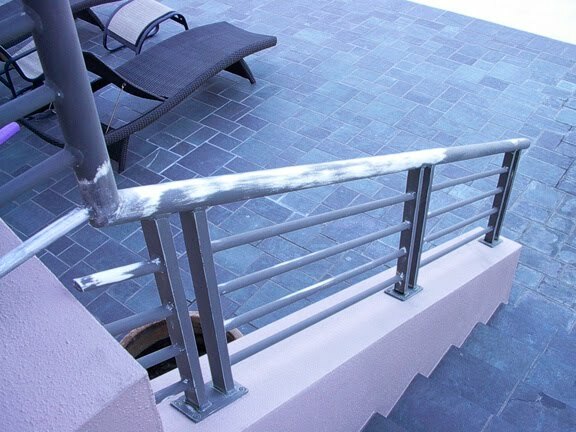 This project is to paint a long railing on a second story patio and then as the stairs go down to the ground level. First I had to sand down the entire railing which is quite the job in itself. Below you can see a section that is sanded and ready to start. The first thing is I primed the railing after sanding it down. After priming I painted the railing a dark brown. I am almost done painting the basecoat on. 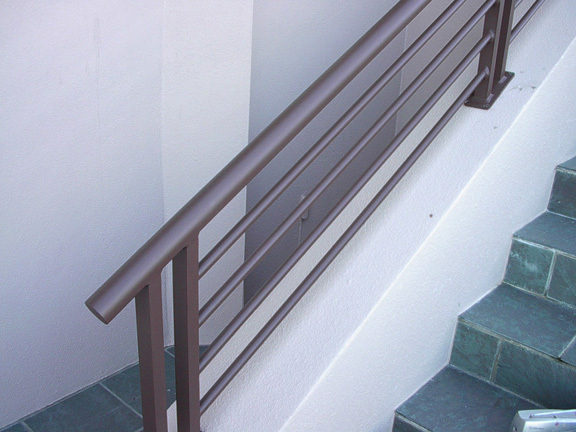 The railing is approximately 140 feet long. The horizontal bars are not that time consuming but the verictal setions that the bars attach to are very time consuming to paint. I should have it all basecoated by Friday. Here is a small section which I had painted to show the client how it is going to turn out. The entire railing will have a beautiful patina look to it.